I recently joined some fellow Eagles at The New Inn for an enlightening and entertaining evening with the former elite level runner David Bedford. David was a world-class runner during the 1970s and famously broke the 10,000m record by running 27 minutes 30.80 seconds on July 13, 1973, at the AAA Championships at Crystal Palace. 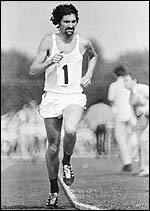 Unfortunately he was unable to translate his renowned ability into medals at the highest level, finishing 6th in the 1971 European 10,000m, 12th at 5000m and 6th at 10,000m in the 1972 Olympics. David was famous for his fierce front running, which compensated for his lack of final kick, but also for his distinctive drooping moustache, long hair and bright red socks. A resident of the Hamstead Heath area meant some serious training runs on Parliament Hill where he would go on to take multiple area and national cross-country titles. The punishing 200 mile a week training led to injuries and an early retirement, which meant that David was unable to make the competitive step up to the marathon. However, he would enter running folklore by famously running the first London Marathon following a bet made in a nightclub the night before. He won the bet by completing the marathon but was pictured vomiting at the road side and was quick to confirm that a large curry during the early hours is not the ideal way to fuel yourself for a marathon. Following an end to competitive running he went on to become secretary of the AAA of England between 1993-4, a foundation for taking over the position of Race Director of the London Marathon up to and including the 2012 race. He remains involved with the London Marathon, looking after the elite entries and his ability to attract some of the greatest distance runners in history has made the event arguably the finest marathon in the world. David was an engaging speaker and took us through his career and confirmed that his 200 mile a week training scheme directly led to the injuries for his early retirement. His passion for running continues to this day and he is a keen supporter of running clubs and the sense of community they give. He clearly believes that running clubs should cater for all abilities and he was also passionate about parkrun and the safe environment parkrun creates for children to take part in the running world. This especially resonated with me as he talked about parents taking their child to parkrun and he could have easily been talking about me and The Son and the benefits we take from our weekly 5km run. David was asked about his thoughts around the recent announcement that Mo Farah would be running the first half of the London Marathon this year and he has since gone on to make his thoughts public through this article in The Sun. Mo himself has also gone on the record to defend his decision and I think it’s fair to say that Alberto Salazar has an idea what is best for Mo as he looks to make the step up to marathon racing in 2014. It was a great evening with a fascinating insight into the thoughts of one of the worlds best back in the day when runners did not enjoy the training and financial benefits handed to the top runners now. David does pop up from time-to-time on the speaking circuit and I would urge anyone with an interest in running to take the opportunity to attend if given the chance.